One of Canada's largest poultry producers is accused of causing its chickens undue pain and suffering by transporting them during a cold snap in B.C. in 2012. Lawyers representing Lilydale Inc. appeared in Provincial Court in Port Coquitlam, B.C., Wednesday to face four charges under the Health of Animals and Meat Inspection Acts. The Canadian Food Inspection Agency claims Lilydale exposed the birds to freezing weather in Jan. 18, 2012. On that day records show it was an unusually cold, –12 C in the Fraser Valley with a wind chill factor of –20. According to court documents, Lilydale moved the chickens from Chilliwack to Port Coquitlam, exposing them to cold, pain and avoidable distress. A company spokesperson could not be reached for comment. BC SPCA spokesman Geoff Urton says investigations are triggered by unusually high death rates like chickens arriving frozen or suffocating from poor ventilation. Urton says Canada has antiquated regulations governing the transportation of farm animals, and that's why his organization is calling for more humane rules. "When something like this happens I think people are generally alarmed to hear that its quite common for animals to die during transport, and that someone would choose to transport these animals on an extremely cold day at –12 C when they should have known that it would cause them to suffer," said Upton. "Just because we eat animals doesn't mean that it is ethical for us to allow them to suffer." The CFIA website lists Lilydale as a repeat animal transportation violator, fined five times previously, but Urton says charges are actually very rare. Comment: The court case is scheduled to continue March 5. Lilydale has a dark history. Some years ago a Lilydale plant was charged with the inhumane slaughter of 284 turkeys by immersing them while fully conscious into a tank of scalding water. The outcome - a measly fine of 2,500. It’s both insulting and a travesty of justice. Another low for humanity. So people, if you’re outraged like I am, continue to fight for all the victims of man’s savagery. Comment: Corporate greed and profits at all costs. Suffering, death, and exploitation of the weaker while most look the other way or simply don’t care. In the absence of morality and/or good legal standards that are rigorously enforced we end up with a race to the bottom and we are in the midst of an inexorable slide right now. Will this lawsuit cause Hallmark to change its ways or is it merely the cost of doing business? We can help shut it down by avoiding any and all animal products. Go vegan today. Comment: MFA has been in Canada for four years and this is its 11th investigation. Clearly, leaving it to industry to police itself is not an effective way to enforce animal welfare standards and prevent abuse. As well, government should not be financing the torture of animals by providing subsidies or bailouts to the animal agriculture industry. Investors are backing meatless companies nowadays, and the public is increasingly shying away for the consumption of animal products. June 13, 2017 comment: The graphic undercover video shot by Mercy for Animals depicts multiple workers throwing, hitting, dismembering and killing chickens, and forcing the birds into violent sexual acts with each other. The law must seek proper justice (although no punishment will be fitting) for the tortured and voiceless victims of this most vile crime!! The charges come as a result of an investigation by the Canadian Food Inspection Agency (CFIA) following receipt of an undercover video. Facing 38 charges are Elite Farm Services Ltd., the company’s owner Dwayne Paul Dueck from Chilliwack, and Sofina Foods Inc./Aliments Sofina Inc., Markham, Ont. “It’s high time Elite Farm Services and Sofina Foods were held accountable for their blatant mistreatment of chickens, who feel pain and suffering just like dogs and cats,” MFA managing director Alanna Devine said in a press release. Anna Pippus, lawyer and director of Farmed Animal Advocacy at Animal Justice, tweeted out that it was“pretty major” that companies were being charged rather than just low-level farmworkers as is often the case. We agree! Many were dead and dying, left to either drown in their own excrement or die of thirst and starvation. 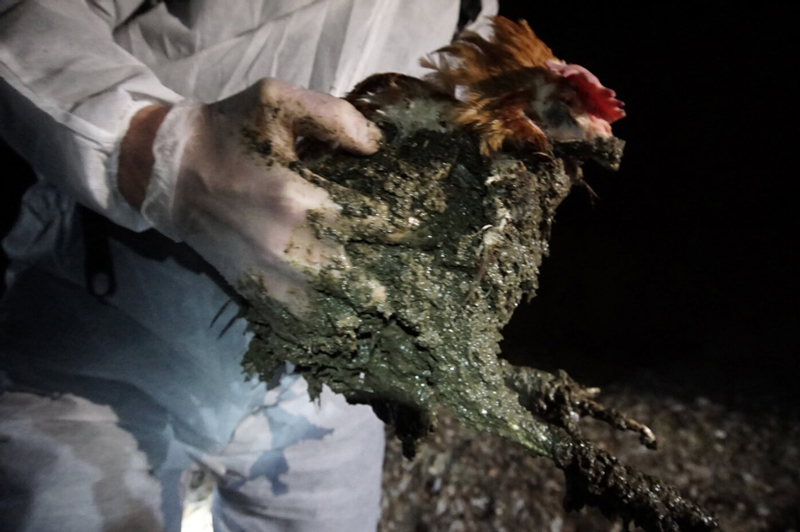 Eyewitnesses found the bodies of more than 200 hens in the manure. Video taken at the properties also depict a number of dead chickens in cages with live birds, and many carcasses lining manure pits under the cages. It was in April, the same month that this gruesome video was shot, that BC Egg had a propaganda piece in the Vancouver Sun. What a contrast! Katie Lowe, executive director, claimed: “We have some of the best food safety rules and animal care practices in the world.” We contacted BC Egg over its extravagant claims. Cruelty is inherent throughout the industry, with undercover investigations exposing egregious abuses every time. Don’t buy the lies! July 12, 2018 update: BC Egg Marketing Board spokesperson, Katie Lowe, says Abbotsford egg farm, Jaedel, has been decommissioned after egregious suffering and cruelty of chickens was exposed by activists last month. Government doesn’t oversee or monitor animal welfare on farms to see if the voluntary Codes of Practice are being adhered to. It is time for intervention. The Codes need to be incorporated into the PCA Act so they can be enforced into law. Industry inspections failed to catch what was in plain sight, further supporting the urgency for action. Self-regulation is not an effective way to enforce animal welfare standards & prevent abuse. The BC poultry industry’s idyllic portrayal to the public is a false one, designed to maximize profits while concealing the gruesome reality behind closed doors. Last week, BC’s NDP government announced that the NFACC Codes of Practice would updated and put into legislation, effective June 1st. Rather than prescribing a positive duty of care, the Codes will be used to describe generally accepted practices of animal management. The requirements as set out in the Codes will provide additional clarity around what is considered to be a generally accepted practice as referenced in the Prevention of Cruelty to Animals Act. However, this language falls well short of holding industry accountable. We need to raise the bar to protect all animals equally under both provincial and federal laws. In 2017, after the Chilliwack Cattle Sales hidden video of dairy cows was revealed, the BC SPCA worked with the provincial government to have the Code of Practice for Dairy Cattle adopted into a new regulation so that the “generally accepted practices” outlined in the code became clearly entrenched in the law,” says Marcie Moriarty, Chief Prevention & Enforcement Officer. “We had hoped to see the same support by the chicken industry.” It was declined. Clearly, this industry cares little or nothing about the lives of chickens, and would prefer to keep the gruesome reality of its business behind closed doors. In 2005, NFACC replaced the Canadian Agri-Food Research Council in coordinating the development of guidelines for the care and handling of farmed animals, known as “codes of practice.” Agriculture & Agri-Foods Canada (AAFC) committed $314,827 to the new agency, an agency that is industry-controlled. It should be noted that the veal calves fact sheet says that whether the animals are humanely raised is entirely dependent on the skills, training, & integrity of the producer. Related: Animal abuse and cruelty is inherent throughout the animal agriculture industry. TysonTorturesAnimals.com. Be sure to visit all our pages!